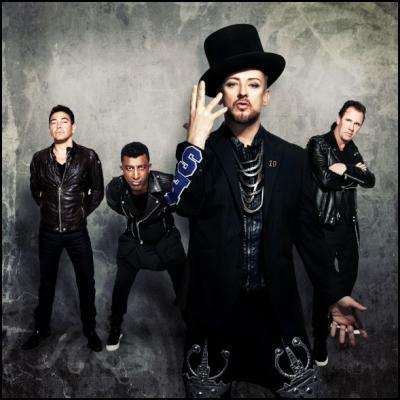 Boy George and Culture Club Announce FIRST EVER NZ Tour! Announce FIRST EVER NZ Tour! 80’s chart toppers Culture Club are heading to New Zealand for the very first time this December to play two shows at Christchurch’s Horncastle Arena on Friday 2nd and Vector Arena, Auckland onSunday 4th December 2016. This will be one huge 80’s dance party not to be missed with Culture Club band members Mikey Craig (bass guitar), Roy Hay (guitar and keyboards), Jon Moss (drums and percussion) and flamboyant front-man Boy George (lead vocals) performing hits such as Karma Chameleon, Do You Really Want To Hurt Me, It’s A Miracle/Miss Me Blind, Victims, The War Song, Move Away and Church of the Poison Mind. As the first multi-racial band with an openly gay front man, Culture Club has set many records, including being the first band since The Beatles to have three Top Ten hits in America from a debut album. Their hit single, Time (Clock of the Heart) has also been included on the Rock N Roll Hall of Fame's list of 500 Songs That Shaped Rock N Roll. In the eighties the band dominated the charts in over a dozen countries, with multi-platinum albums and more than 150 million albums sold worldwide to date. Although they drew influence from the New Romantic movement, Culture Club was also inspired by the music and fashion of Northern Soul, and in 1982 signed a deal with Virgin Records, and the breakthrough hit Do You Really Want To Hurt Me was released, followed by the debut album Kissing To Be Clever, which climbed to No.2 on the NZ charts and went top 10 in the UK and US in 1983. By the time their second album Colour By Numbers – which spawned Karma Chameleon a transatlantic No.1, (including in NZ where it held the top spot for 13 weeks!) which sold over five million copies worldwide but was kept off the US No.1 spot for six consecutive weeks by Michael Jackson's record-breaking Thriller - was released in 1983, Culture Club were one of the most popular groups in the world. In 1984 Culture Club won the Brit Award for Best British Group, the Grammy Award for Best New Artist, and Best British Single (Karma Chameleon). George, during a long battle against drug dependence, confirmed the group's break-up in 1987, the same year he released his first solo single, a cover of the reggae classic Everything I Own, which rode a wave of public sympathy that culminated in a NZ No.3 and UK No.1. In 1989 George embarked on a new dance orientated career having several hits across Europe with Jesus Loves You, which led to him becoming established as one of Britain's leading club DJs and in 1992 he returned to the UK and US Top 30s with the theme song to the hit movie The Crying Game. Put on your dancing shoes for the party of the year this December - Culture Clubs first ever NZ performance as part of their first global tour in over a decade! Find more from The Publicity Machine on InfoPages.